An incoming Navy veteran and nuclear engineer seeks to promote evidence-based thinking on Capitol Hill. Elaine Luria spent much of her engineering career as a naval surface warfare officer in the Pacific, Mediterranean, and Middle East. She kept Tomahawk missile launchers poised, operated up to eight nuclear reactors aboard aircraft carriers, and watched from the bridge as sailors interdicted oil smugglers in the Persian Gulf. Before retiring in 2017, she led 400 sailors and officers as commander of Assault Craft Unit TWO, keeping 24 landing craft—some of the Navy’s oldest boats—combat ready. Now, with no prior political experience, Luria is among a wave of freshman lawmakers—including a historic cohort of women—who helped Democrats win back control of the U.S. House of Representatives. In a chamber dominated by members from law and business, she joins a group of four Democratic newcomers trained as engineers. An engineer’s methodical thinking will help develop “evidence based” legislation, Luria, 43, tells Prism. “Throughout my professional career I’ve always been the kind of person to say, ‘What is the reference? What are the facts? What are you basing this calculation on?’ I think people who come to decision-making with that type of process add value to an organization.” Her background, she adds, will help her grasp complex, emerging threats, such as those involving artificial intelligence and cybersecurity. She doesn’t mention last year’s grilling of Mark Zuckerberg and other Silicon Valley titans, which commentators say exposed Congress’s embarrassing technological ignorance. 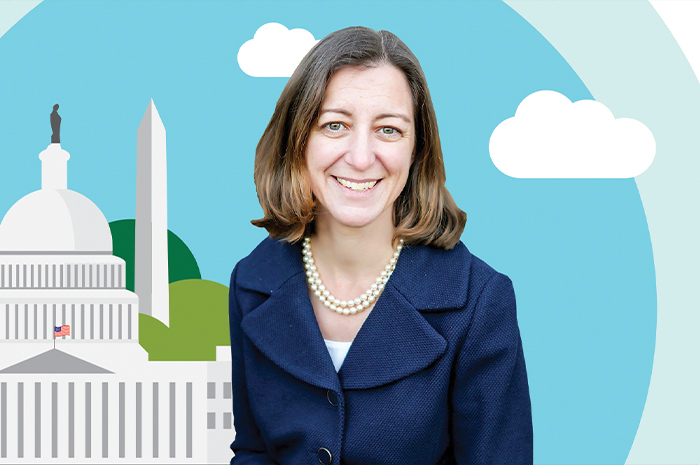 Representing Virginia’s coastal Hampton Roads, home to the world’s biggest naval base and shipyards serving a fourth of the U.S. naval fleet, Luria quickly secured a seat on the Armed Services Committee and hopes to serve on its seapower subcommittee. She has also asked to join the climate change committee. Recurrent floods from rising sea levels and sinking land (a result of groundwater depletion) pose a threat to her district’s military installations, she says. Another danger she sees is offshore oil and gas drilling, something championed by the Trump administration. The first legislation she cosponsored would ban all drilling off the coasts of Virginia, North Carolina, Maryland, and Delaware. Born in Birmingham, Ala., where her family owned a scrap metal business, Luria made the rare choice at her high school of applying to the U.S. Naval Academy. She entered intending to major in history, but brought sufficient math and science chops to graduate with a double major in physics and history. She went on to gain surface warfare and Tomahawk missile training and enroll in the Navy’s elite Nuclear Power School, which had only recently opened to women. Completing certification as a nuclear engineer after her first deployment, on a destroyer, she qualified to oversee reactors aboard nuclear aircraft carriers and train hundreds of reactor operators. It was an exacting job, particularly while the ship’s aircraft were striking targets in Iraq and Afghanistan. Besides powering all electrical systems and engines that propel 100,000 tons of steel at up to 30 knots, the reactors also provide steam that drives the plane-launching catapults. “People say, ‘Oh, you were an engineer.’ I say, ‘Well, I tended the operating side.’ I wasn’t designing new technology but certainly operating the equipment that many, many engineers put their work into the design of.” Life aboard a carrier also included hosting a Passover seder in the library as jets roared above. Midway through her two decades in the Navy, Luria earned a master’s in engineering management from Old Dominion University, one of a half-dozen universities in or near her current district, and later received a Naval War College diploma. Entering politics in January 2018, Luria pledged “to create solutions that serve all Americans, instead of partisan politicians whose bickering yields little for the hardworking families of our Commonwealth.” Benefiting from a late surge of campaign money, she defeated incumbent Republican Scott Taylor. In her first month on Capitol Hill, Luria got caught up in the drama surrounding a record-long government shutdown. She asked that her salary be withheld in sympathy with furloughed federal workers, and was part of a delegation led by House Speaker Nancy Pelosi whose overseas trip to visit troops and U.S. allies was grounded by President Trump. Later, she gathered 30 Democratic signatures on a letter to Pelosi urging that Trump be allowed a vote on his border-wall demand if he reopened the government. Mark Matthews is editor of Prism.